We’ve looked inside Amish homes many times before. Today, something a little different: an English-owned home, inspired by the design of Amish houses and built by an Amish contractor. My English friends who live in this home near Shipshewana, Indiana, previously lived at Arthur, Illinois. They had this home built three years ago with a distinctly Amish flavor. As you can see below, the exterior blends in with the surrounding Amish houses. In fact, when I first visited them, I probably would have driven right by had my GPS not told me to turn in this drive. Most of their immediate neighbors are Amish. Their floor plan was inspired by a friend’s “shop house” in Arthur. They built a pole building and framed in bedrooms in the back half of the house, leaving a large open living area with the kitchen at one end. The house was built by an Amishman who did everything except pour the basement walls and install the plumbing and electric. 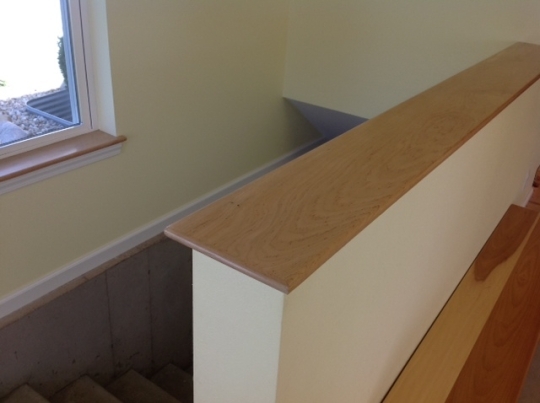 The wooden window sills and trim work came from maple trees out of the Amish contractor’s backyard. 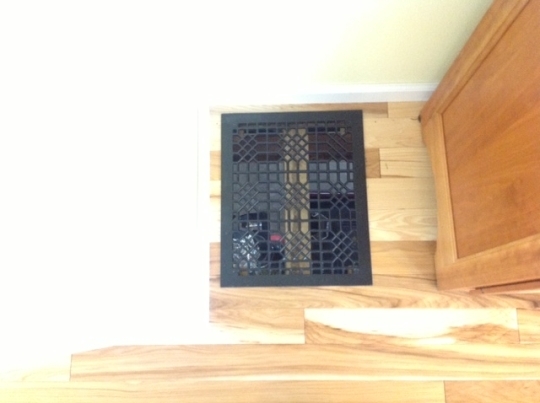 Old cast iron floor grates find new life in Amish communities where they are sand blasted, powder coated and installed in homes. The concrete floored entry “wash room” with a floor drain is typical in Amish houses. The owners chose to install a gas range for canning in the entry room, which was a common feature in the Arthur, Illinois community. “Before we moved to the area we tried to find a house to purchase. We looked at several Amish houses with the intent of retrofitting them with electricity,” my friend explains. They eventually chose to build new. 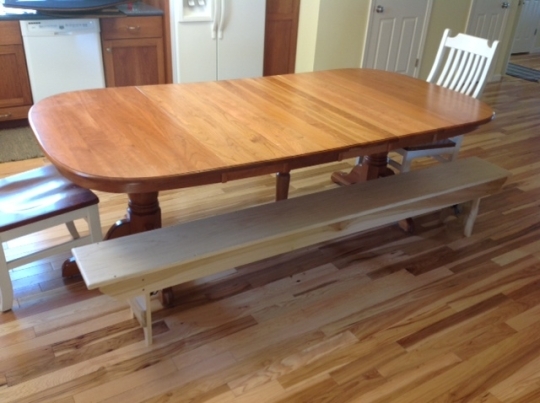 Church benches are used for seating at the kitchen table. The table has 12 leaves and expands to 16 feet. A neighbor plowing his family garden during the fall. Will some electrician explain why the electric outlet where the stove is plugged in appears to be upside down. Some of those in our house are that way, too, and it looks so awkward to me. Also, it seems to me that it’s placing an unnatural strain on the cord. There must be some real safety reason for this, so please explain. Thanks. I’m pretty sure that 3 and 4 wire range and dryer outlets normally have their grounding conductors down, so putting the outlet upside down would put the grounding conductor up, even on these large, special purpose outlets. Of course doing so does kind of mess up cords designed for flush-to-the-wall mounting like most refrigerator, dryer, and range cords. Adding to my comment… Of course the upside down arrangement does stress cords a bit more, but in the opinion of some local code enforcement officers such as the one in our town, this isn’t as important as shielding the outlets from being “bladed” from the top down. This is an example of how national and state codes often defer to local code enforcement officers on some things. Flipping a single outlet or two over to the “normal” position in order to accommodate a flush-mount fridge plug, which would be plugged into a more or less concealed outlet, not normally used by much else, would most likely be okay with our inspector and probably many inspectors that otherwise prefer upside down outlets. Sometimes too, a range cord is so short that even an upside down plug actually bends the cord less on its way to the range body itself. For that matter, our stove is electric and the outlet is installed at floor level with an outlet box mounted *sideways* so the cord comes out and rests even along the floor next to the baseboard. I guess that was okayed by our inspector. One very last thing 🙂 I see that range in the picture is a gas range with a normal, 120V plug for the igniter and electrical controls. That plug, being an ordinary plug and out in the open, would get an upside down install according to our local inspector. My comments above about range cords were made with 240V, electric stove cords in mind. Very interesting, Stephen B. And makes good sense, too. I was at a hospital today (built in the year 2000, or thereabout) and noticed that all of the electrical outlets were “upside down,” so to speak. I’ve never seen a power outlet off to the side of a kitchen appliance. WHY would it not have been placed behind the stove?? Then it would not matter which direction it was facing. Installer’s preference. The National Electrical Code doesn’t specify which way they should be installed, but as most people have noticed manufacturers of stuff that plug in assume the ground-down, neutral (wider blade) on the left orientation. Love the pictures, allowing us a peek inside of this home. I would imagine these “Amish” Contractor-built homes are MUCH better built than “other” builders, at least that is my guess. So many homes, are put up in a hurry, with lots of short-cuts taken in construction, with most times “builder-grade” (cheaper)items……unless you pay in the higher 6 figure prices for a new house these days. I do like this design, and love the wood trim, window sills, and wood floors. Magnificent work!! I don’t recall seeing a Fireplace — or is that more trouble than the coal-fired furnace, and more expensive to operate (chopping wood/storing it, etc)? What a lovely, practical home! My favorite feature is the washroom. 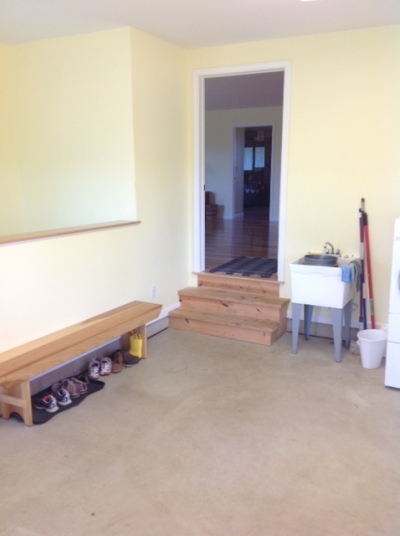 We have been talking about how practical it is to have a mud room/washroom with a concrete floor and center drain. I also love the pull out bathroom steps for children. I look forward to showing my husband these pictures this evening after work. They highlight everything that our current house is not. Ours has zero storage, is artsy (past owner was extremely “creative”), busy, impractical, and next to impossible to clean. I’m ready for something clean, cheerful, and well-planned. Thanks for sharing! If you decide your interested in the floor plan I can send you a copy of the floor plan / contractors quote. 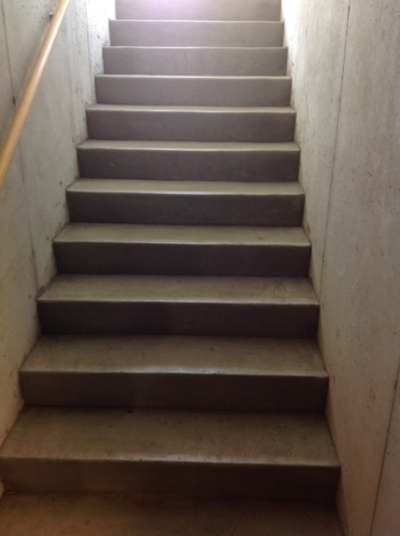 The builder did add a coat closet above where the steps go to the basement. That is not shown on the floor plan that’s pictured in this post. I gave a copy to an Amish friend who plans to build next spring, they are considering using the plan but making it a two story home. Thanks for the pictures and article. I was surprised that the kitchen wasn’t a bit larger with a bake island and room for more than 1 or 2 cooks at a time. Are islands/tables built to move? 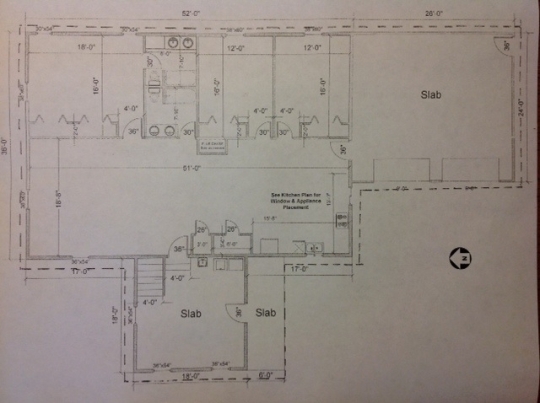 Is there a cost associated with getting a copy of the house plans? No charge for the house plans. I just put them in a pdf and sent the to Erik. If you would like a copy, please contact him. I have them now Sandra, just let me know what email I should send them to. Wonderful! Thank you so much! Email is sandyko49@gmail.com. Can i get a copy of the house plans? We are planning on building and I really like the layout of the house. Erik did have a copy of the house plans and the price quote from our contractor. If he no longer has a copy of the plans please provide him with your contact information and I can send you a copy directly. I will mail you a copy of the plans on Monday. Just curious — how long does it take an Amish home-builder to construct a house of this type? And, is it done like the “barn-raising” with a lot of workers, or is it done just with the builder himself and a couple of ‘hands’? Also, I usually never see “shutters” on the sides of windows — is this thought to be too “Fancy” (or too decorative) or is that more of a colonial style, which is not “Amish”? 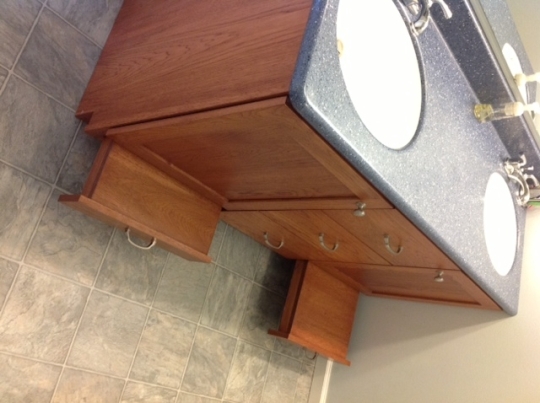 Really love the idea of the “pull out” steps, on the vanity, for kids! I would have never thought of that — amazing! This house was done in three months. It was an older Amishman who currently has a crew of 4 (himself, a son, a son-in-law and a driver). He helped build many of the larger timber farm projects around (ie. Davis mercantile, American Countryside Farmers Market) and is supposed to be one of those involved in the construction of the Ark project at the creation museum in Kentucky. Somehow speed, quality and affordability can all go together. When my parents decided to move here this year we used the same contractor to build their house. I think shutters are seen as an unnecessary adornment, one of those lines that Amish society chooses to draw. Yet they are not unheard of and Amish who purchase an english home will usually leave the shutters in place, at least here in Elkhart-LaGrange. I asked my son, Mark, who is Amish about the window shutters. He said that most Amish would not allow them. The fake shutters are just for decoration and the Amish like a plain house. Mark would like to have real, working shutters on his house. They would make the house cooler in the summer. The summer sun beats in his west windows in the afternoon. The ministers don’t seem to be so opposed to working shutters that serve a purpose. Mark isn’t sure about putting any up yet. I’m not Amish, but I agree with the useless sentiment. My house has decorative shutters and when I renovate the house, which will involve moving/replacing a bunch of windows along with modifying the house siding, the fake shutters are coming off. Lots of older houses in northern New England where I am talking about also skip the shutters. I also think real shutters to keep out the summer sun would be a good thing. That certainly looks like a SOLID home. I, too, love the idea of the pull-out steps for the kids. Using the builder’s own home-grown lumber is wonderful and makes it that much more special. 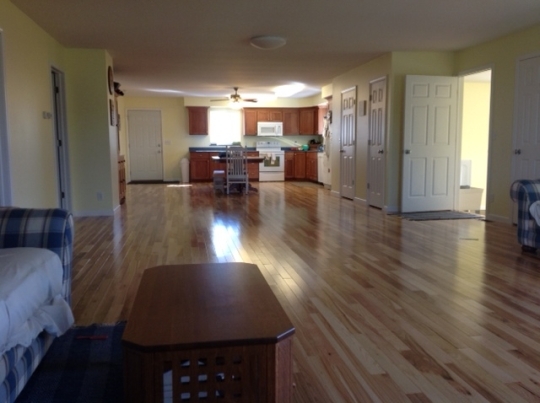 I can picture my “childhood self” getting a running start, then sliding down the expanse of that beautiful wood floors! Thanks for a unique story incorporating Amish quality and practicality. Alice Mary; You would STILL like to slide down those floors, wouldn’t you? I know that I would! Sure, OldKat, if my one “new” (replaced in 2010) knee and one “old”/achy knee would let me get up enough speed, I’d LOVE to slide away…MANY times over! I have one, too. I don’t have a “new” knee, but I sure have an “old”/ achy one. Virtually every injury I have ever had has been to that knee & at certain times of the year … like this VERY MINUTE … I get reminded why I should have taken better care of it when I was younger. I’d STILL venture a slide on those floors though! Of course; I’d probably fall, break something in the house …if not my knee. Love, love love this house. As I look around my cluttered electronic filled living room I long for this home. Easy to clean and bright and open. Time to purge my things. You and me both, Debbie H — Would love to own a home such as this; I think we all wish for simpler times, but seems the way of the world these days is going “high-tech” and trendy & modern. Have always said, and continue to say, we could all learn a thing or two, from our Amish neighbors! Again, their many talents are so many! A fireplace is not only not an efficient heat source, but as the fire dies in the night becomes a huge heat loss not only continuing to draft warm air out, but the masonry through the roof radiates heat upwards with it’s mass. (heating efficiency actually approaches negative numbers) A coal or wood insert in the hearth helps, (Ben Franklins idea, later perfected by Bob Fisher) but is not as efficient as a freestanding stove. Insulated flue liners help, but reduce the advantage of thermal mass in the building. Most local tax laws also consider a fireplace adds value and are taxed, compared to no tax on a chimney with stove inlet. OH thanks, Paul Long, for this very good explanation of the fireplace vs. coal. Being born/raised/living in Florida, I never knew this! In my youth, we had a fuel-oil, free-standing stove, then as we progressed through the 60’s, fuel-oil “in the wall” heater, then now, we have Central AC/Heat Pump. All electric. Coal does make a lot of sense! But, might be hard to find in Florida (?)….. THANKS! I love your home. Much happiness living there. I wish I had Amish families for neighbors that would warm my heart. Thinking the Amish would be good neighbors we would like to live in proximity to an Amish community. My wife and I are “born again” Christians (Catholic) with traditional, old fashion values and do not desire to “become Amish”. We are retired and would like to relocate to a rural community, build a home, have a huge garden, strive to be a good neighbor and otherwise follow Christ’s teachings. I sent two letters to an Amish man in Maine hoping for a dialogue concerning our desires but got no response. Comment to David — locating an Amish community to live in — I’m thinking Amish like their privacy, which is understandable. You might have to “search” on your own, and not likely that “Amish” will be advertising “Build here”, so to speak. What community were you considering? I can see a letter being overlooked without a personal connection. Personally, I’d find the community you want to live in and make some personal connections. We visited our first amish community 6 years ago, fell in love with the people and 5 months later moved into the community. Since then we have lived in 2 Amish communities and visited about a dozen communities. I cannot image a time when we would leave to live in a non-amish community. The biggest part of being integrated is going out of your way to be a neighbor. Helping your neighbors put up hay, give them a ride when they have an emergency that sort of thing. When we lived in Arthur I made a point of going over and helping my neighbor anytime I saw him working on a project (hand trenching gas line, building a carriage house, pouring sidewalks, digging potatoes, putting up hay…). It’s that sort of investment in people that makes you part of the community. It sounds like you are interested in doing just that sort of thing and I wish you the best. We live near Amish communities in Clark and Chippewa counties in Wisconsin and would love to have them as our neighbors. I love all those horses and the frequent auctions, too. My daughter and my one year old granddaughter live with me now. We wish to live near these people that appear to have good morals and manners like those we notice in town at the stores, etc. We’re concerned about public schools and the influence it could have on the baby girl as she grows up. She can be home schooled, but needs good friends like we used to have way back when I grew up on farm near here. A good friend/brother in the Lord that used to live in Amish community in Maine would be a helpful person to direct your inquiry-he’s posted here before and posted his email so I am confident he would not mind & be helpful to you-I can only guess why you might not have heard back-I am familiar with Smyrna Mills ME Amish community & Unity-haven’t visited, but am familiar. This man, knows them well and would shed some light on it for you. I Love the flooring! I thought about having the wood floors restored in my home after a fire, but decided it was too costly and I have a dog. My home was built sometime before 1900 and the floor boards seemed wide compared to what is the norm now. I have some of the cast iron floor grates too and might restore them and use them as wall art. Is the rest of the furniture Amish made? Besides the table, that is. I have bedroom furniture that is. It took 3 months to get it, but was well worth the wait. It was made in Sugarcreek, Ohio and I live in Wisconsin. The furniture is all Amish made and every piece has a story. I like wood and the Amish are notorious for selling really nice furniture at benefit auctions. As a result, nothing matches but I’ve enjoyed the acquiring each piece. As long as the flooring is solid as in little flex, you can lay cement board with thin set mortar under it, screw down properly, and cover with tile that looks like wood. (Floors with movement use Latex admix with thin set mortar for flexible bond). The tile pieces are about 6 inches wide and 2 feet long. Depends on brand. I did mine with very small joints about 1/8 inch, and used non sanded black grout. It looks like wood with durability of tile. Hi, we live in Taylorsville, KY, and in a few years, I want to do some work in our house, build a useable barn, ( just have a small metal bldg. now) and I want it all to be Amish built. What happens when we do not live in buggy distance to a community? We would be more than willing to have the workers and family stay with us- providing there aren’t dozens! I want to go to the communities and get to know some Amish friends, but have been laid up with a cast. Also, do the Amish communities ever hire non-Amish school teachers, or need help for children who have reading difficulty? Just getting to your questions late here Tina. Most Amish builders will travel some distance. Only the most conservative (like Swartzentruber churches) keep it within buggying distance. Those who travel may stay overnight for certain jobs. Besides builders in KY, there may be some in southern Indiana (Daviess Co in particular) which would travel to your area. Though traditionally, greater distance=greater cost. 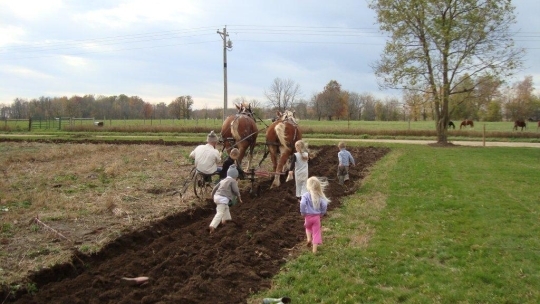 As for non-Amish teachers in Amish schools, it is not common but happens sometimes. I am aware of such cases in Ohio and Indiana. Glad it struck a chord, MM! I know you have ties to the Mt. Hope area. And happy to hear from you here anytime. Erik, please send me the house plans when you have a chance… Thanks! the comments from ShipshewanaIndiana, the owner.If you come across any similar houses, I’d be interested in seeing pictures of them and reading information about the story behind the building of those houses. I’ve just seen my dream home!! :o) LOVELY wood used throughout–just so beautiful. Everything looks so well done, much attention to detail. And I love that wash room/entry! And I’ve learned more about electrics than I ever had before–LOL! So much about this place appeals–the overall simplicity, practical considerations, the light, the open spaces for gracious living and family time. 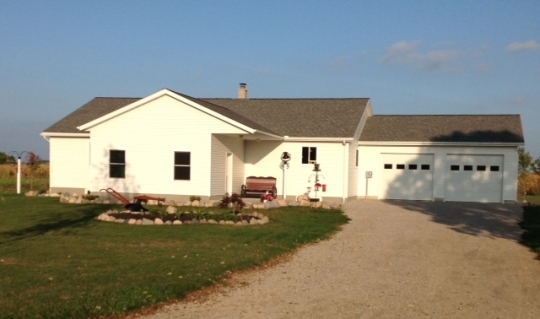 My recollection of homes in Amish/Mennonite Country Ontario is rather limited and vague, and I don’t recall if the design feature I noticed in the very first picture was used, but I need to ask, and I think it is a fair question, garages; are they common features on purpose built Amish homes? I ask because I notice that this one features a two car garage, now, I suppose a traditional Old Order family could, if they wanted, have a two car garage in order to store two carriages or other equipment as needed, especially if the home was, I’ll coin a phrase, “un-fitted” the building so to convert an English home into an Amish one. I can only speak authoritatively of two communities, Arthur and Elkhart-Lagrange. When we lived in Arthur, new single story Amish homes were being built with garages. The garages were being used to hold buggies and for church. 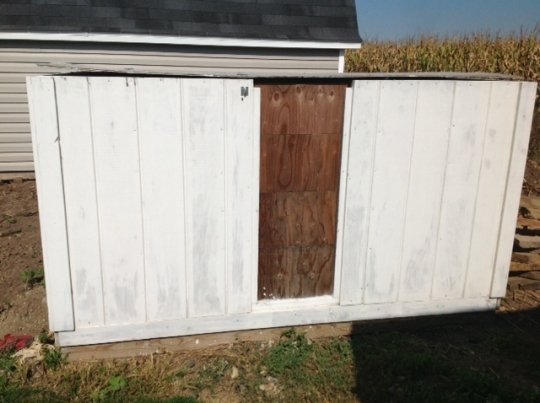 Here in northern Indiana, garages are also a common design feature on new Amish homes. Again, they are most common on the single story home or “shop house”. With regard to shutters, i recall having shutters on the house in Holmes County where I was born. It was apparent the shutters were old then which was in the 1940’s They were still functional, although they needed some paint and TLC. I think they were not approved at the time but not allowed to be replaced. The house was built by our Amish great-great grandfather. It was framed like a barn. There was still evidence of the original log cabin on the farm as well. So, it is certain the Amish built shuttered houses back in the 1800’s. All depends on where you’re building and draining. Many building codes do not permit center drains due to substances going into the drain that can contaminate the soil. I know we were not permitted to put one in our garage. Thanks for sharing a peek at the floor plan. Very nice photos. Where is the “front” door to this house? The front door is in the entry/wash room/mud room. What would be a design for a Daadi Haus? I asked my son, Mark, about front doors on Amish houses. He said that if an Amish house has a front door it is usually a house that was once built and lived in by English people. Amish people don’t use front doors. The Amish are practical people and see no use for front doors and foyers and all of that. They aren’t trying to impress anybody with with a grand entrance. Almost all Amish enter and exit their house through a mudroom or laundry room and that includes guests, too. Usually, these open up into the kitchen. Absolutely. And there’s nothing like trying to find the “right” door on which to knock when the “house” is a combination of multiple additions, breezeways and sunrooms connecting two houses and a shop. You can have nearly a dozen exterior doors from which to choose. And thanks to you shipshewanaIndiana for letting us take a look at your wonderful home! Thanks for posting these Eric. I really enjoyed looking at them! I also would like to see pictures and plans for a dawdihouse. Thanks! Interesting discussion on front doors. I’m wondering if there is a difference amongst different Amish settlements/affiliations in the building and use of front doors. I regularly visit three Swartzentruber Amish families who all live in houses built by them and their Amish friends. All have easily-indentifiable front doors, and use them. They also have mud rooms/laundry rooms. It seems like if a family member or visitor has been outside and their shoes or boots (or clothes) are really dirty or muddy, they enter through the side door that leads off the mudroom/laundry room. Yet they all also regularly use their front doors. In these houses the front door opens directly into the kitchen. Yes, thanks for the detailed pictures of the inside of your home. The theory of installing receptacles with the ground prong up is in case anything metallic falls down the wall it could contact the two blades causing a short, melting the offending conductor and hopefully tripping the breaker. 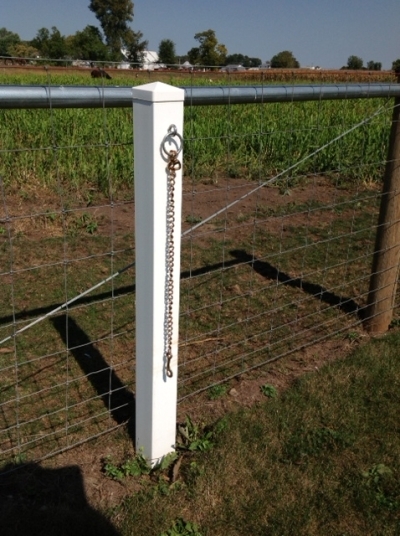 If anything falls down the wall and hits the ground, the hot and neutral blades are protected below it. I noticed many homes wired that way in NJ and that’s the answer I was given. For that reason, I install sideways outlets with the large slot (neutral) up so anything that could drop doesn’t come in contact with the smaller blade. (hot) No codes specify a right or wrong direction and a codes officer who makes his own rules has an abuse of power issue. All codes favor the codes officer with their “right to interpretation”, so it’s not always worth the aggrivation trying to teach one. There is an old saying that goes “Those who can’t do; teach. Those who can’t teach; inspect”. (ouch) So don’t expect to teach them anything new. 🙂 So most put them the “old” way; ground down since so many manufacturers make plugs and transformers made in that direction. They are easy enough to turn the power off and rotate if given enough wire inside. When I wire a switched receptacle for turning a light on that is required by code to prevent a person from crossing a room in the dark without a ceiling light,(good for behind the Christmas tree too) I install them upside down to show there is something different about that receptacle. I must have a compulsive behavior that all the screws have to be facing the same direction as well. The slot imust be vertical when tightend on light switches or receptacles so it’s lengthwise with the rectangular cover plate! In PA, ALL drains including floor must be connected to the sewer system. They don’t want fluids from vehicles washed into the ground when the floor is cleaned. (where the fluids drop from all vehicles outside anyway) I personally don’t want salt from melting wheel wells seeping into my septic system with other oils. I built a mud room with sink the same way for washing up before touching anything in the house, it’s also great for a quarentine for sick or injured animals or cleaning up the skunk sprayed cat instead of the tub……… I put a laundry connection in it so as we get older we can have the laundry on the same level instead of the basement. Our freezer is in there as well as a shelf system for kitchen pantry. Used as the main entrance all winter, it makes an air locker to prevent air exchange through the entire home when door is opened. It just makes sense. 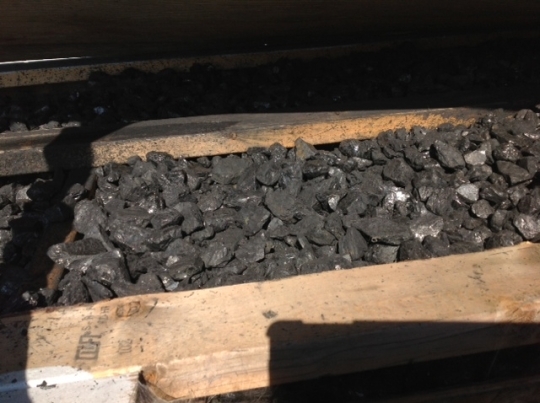 Before storms we bring coal or wood in so we don’t have to dig out right away, and it’s sure to be dry. It’s the most used room in the house! Thanks for YOUR detail: I’ve copied your comment to a list of “look at ideas” I’m collecting for my next (last?) home. Just a quick note about your comment regarding “All drains in PA” IF you are required to do so, in a specific municipality, in PA, please be aware that it is a local regulation. PA. uses the IRC single family code, and it has no specific requirement to drain any surface run-off to a sewer system. It would be a really bad idea for several reasons, including introducing harmful chemicals to an on-site system, and it would directly conflict with municipal requirements in many locations to remove anything but true sewage inputs on municipal sewer systems, by banning inputs from gutters, floor drains, etc….. I am a recently retired homebuilder from PA. I know the Amish are not connected to the grid, but, I’vet looked up prices for gas refrigerators, and they are expensive! As is propane now! 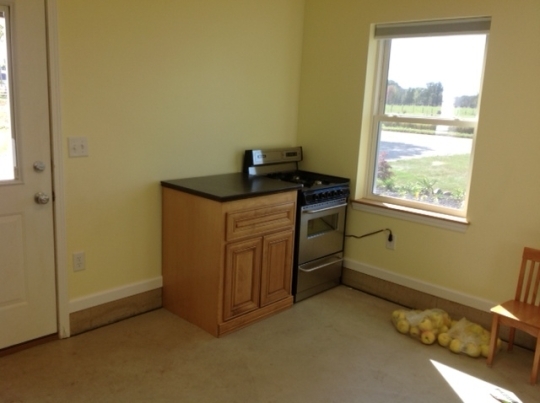 So, what do the propane/ generator/ appliances run in dollars for an Amish home? 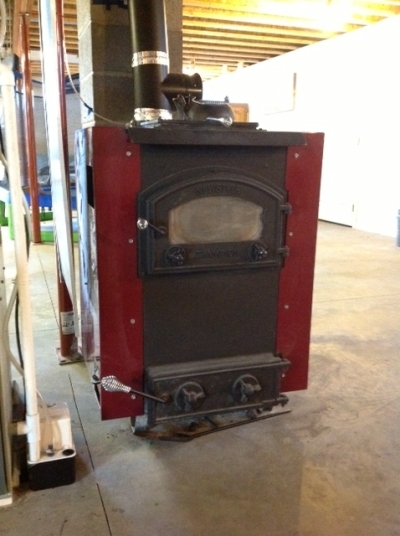 We have a five hundred gallon tank and it costs around $1,000.00 to fill, and we ONLY use it for backup heat! Thanks for answering. PS- are there any pictures and/or of the dawdi haus? PPS.- The next house we buy will have a mud/laundry/ pet room! I hate not having one! It’s basically just a smaller house attached to the main house. As far as plans, I don’t have any, you’d probably have to go to someone Amish for that. In some areas, if there are two houses on one property, the zoning requires the smaller house to be half the size, or less, of the bigger house. The Lebanon Daily News in Pennsylvania had an article about dawdi (grandparent) housing, titled “Heidelberg prepares for Amish housing trend.” Their concern is that an in-law apartment may become a rental unit after the family no longer needs it. They aren’t cheap due to being amonia filled. They use little propane, you wouldn’t notice much useage. About a gallon a week. The burner is tiny and only takes enough heat to boil what is in the boiler chamber. Heated amonia wants to stay hot. So it absorbs heat from surronding area and extracts heat from it. So boiling amonia rises to the top where the freezer section is and gravity trickles it down to fridge section where there is an aluminum fin arrangement to absorb more heat from fridge compartment. It trickles down to be reheated in the boiler chamber. This is simplified, since chemicals are added for anti-caking agents to the fluid. They even have a trap in the tubing that fills with a drip slowly and dumps intop boiler chamber when full to cool the boiling and give a short defrost cycle. They are much smaller area inside and much thicker wall insulation since they don’t “make cold” like a compressor driven unit with freon. They are called absorbson type since they actually only move heat. They can boil the fliud with propane, kerosene or electric heating element. They are not as efficient with electric. The element is like a curling iron that glows cherry red, but not as hot as a flame. Kerosene use a wick. We already have cold on the planet and all our heat is from the sun, so pumping heat out of an insulated box gets cold. It takes 8 hours or more to cool down, and longe rif warm food is put in, since the heat in food needs to be absorbed as well. Many vent the heat from inside box and burner outside. They will hold about half the capacity of what a electric fridge holds with smaller freezer section. It is a dangerous process to recharge and the cooling units are sealed, hence the price. But this was the first mechanical refridgeration known. The chemical is not household cleaning amonia. That is about 1 % pure amonia, 99% water, so you can imagine what the pure stuff smells like. It will knock you out if there is a leak in the freezer section when in operation and door is opened. Luckily they usually leak at the boiler section outside the box and leave a bright yellow residue from a very small crack in the tubing where there is the most expansion and contraction from heat. There are propane and diesel fuel fired toilets as well that are quite expensive, burn everything to ash with a timer, but cheaper than building a septic system and require no power. Thanks to both Eric and Paul for the answers and information. It’s going into my building/ reno file!